We talked about Harlem’s history, how that history can be preserved, and where Harlem is going now. We also discussed Jonathan’s journalism career, during which he worked with legendary Village Voice reporter Wayne Barrett. My favorite part might have been Jonathan going into the process of writing a history book and his list of favorite Harlemites, which comes towards the end. Special thanks to Absent Tiger for letting us use “City Lights” for the intro/outro. The transcript below is a heavily excerpted and condensed version of the full interview, which you can listen to here: http://janosnyc.podbean.com/. Janos: Was it the jazz music of the Harlem Renaissance that first got you interested in Harlem? Jonathan: I grew up in an upper-middle class white suburb of New York City. I found something that really touched me about jazz music, and I got really into African-American culture. I went to Columbia and worked at the radio station, WKCR, which has huge troves of jazz music, that’s really what got me into it. I would walk around in uptown New York City and look around and think, ‘There’s so much history here! This building is a church, but it has a Jewish star on the front!’ There were so many stories that seemed untold. But to tell you the truth, the reason I got into this book was that no one had ever done it. 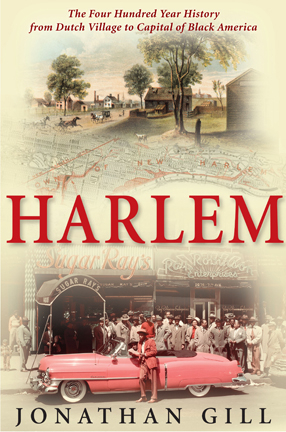 Janos: What was the most surprising thing you didn’t know about Harlem before you started researching the book? Jonathan: I had some very romantic ideas about the 1960s revolutionaries. I was really enamored of people like the Black Panthers- I’d gotten that through the free jazz music of the 60s. But surprisingly I came out of it with far less admiration for these characters. They were much more invested in race than I was comfortable with. And I also came away with a much greater appreciation for the Freedom Warriors like Bayard Rustin, the pacifists of the civil rights movement. Janos: Do you think if an addendum to this book was written 20 years from now, you would have a more pronounced Dominican chapter? Janos How are the fields of journalism and history different when it comes to satisfying your quest for knowledge? Janos: Give me a list of your top 3-5 favorite legends of Harlem. Jonathan: #1 Top of the top: Alexander Hamilton. He was a man of great contradictions. What broke my heart as a father was his relationship to his children. Remember, his son was killed in a duel in the same place, over the same issue, with the same guns…and he had executive energy, the ability to make things happen. I love that guy, and he was a real discovery for me, especially after years of studying at Columbia in Hamilton Hall. #2 James Reese Europe. We think of jazz being invented in New Orleans, but it wasn’t, it was invented by James Reese Europe in Harlem in the years before World War I. We love Jimi Hendrix’s “Machine Gun” – 60 years before that, James Reese Europe was putting in machine gun sound effects into his tunes. Dead by the age of 40, murdered by his drummer…I love this guy. #4 Bayard Rustin, the American Socrates, who taught Martin Luther King, Jr. everything he knew about pacifism.